November 19th is a day that many or most Xbox 360 owners are looking forward to in anticipation of the New Xbox Experience. The New Xbox Experience promises to provide an interactive experience that is rich, engaging and more social than ever. • Xbox LIVE Party. 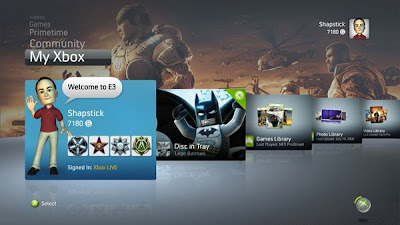 This will allow you to create and host a virtual party via Xbox LIVE with up to seven friends. Using Xbox LIVE Party, you will have the ability to voice chat while you play games, share photos in real time and entertain your friends. • Personality plus. You can now create a customizable, animated avatar and dive into the world of Xbox LIVE. Your avatar is your virtual being throughout the New Xbox Experience and represents your personality on Xbox LIVE. • Your personal game room. Play classic games such as “PAC-MAN Championship Edition,” “Galaga Legions” and “Portal: Still Alive”. Also play games that put your avatars in the action, such as “A Kingdom for Keflings,” “UNO,” “Hardwood Hearts” and “Hardwood Spades,” exclusively for download from Xbox LIVE Arcade. Xbox LIVE members will be able to access the Xbox LIVE Marketplace, Xbox LIVE Arcade and queue content to download directly from Xbox.com. • Games for the community, by the community. For the first time in the history of console gaming, community developed games will be available to the public for download. The Community Games channel on Xbox LIVE will include games made by students and hobbyists, and will be exclusive to Xbox LIVE. These are just a few things to look forward to with the New Xbox Experience when it launches on November 19th. Keep tuned to NextGen Player in the coming weeks as we will be working on getting an opportunity to interview Craig Flannigan - Platform Manager for Xbox, for his thoughts and insights on the New Xbox Experience.